There is so much to love about the modern wedding halo. Traditionally embraced by boho brides, today’s wedding halo caters for a range of brides: luxe, minimalist, boho, European chic and vintage. And don’t feel pressure to wear your luscious locks out. Though the wedding halo is perfect for tousled waves and luxe blow waves. If your ultimate bridal look is a classic wedding updo, the wedding halo – or as we sometimes call it, the full wedding crown – is truly a match made in heaven. 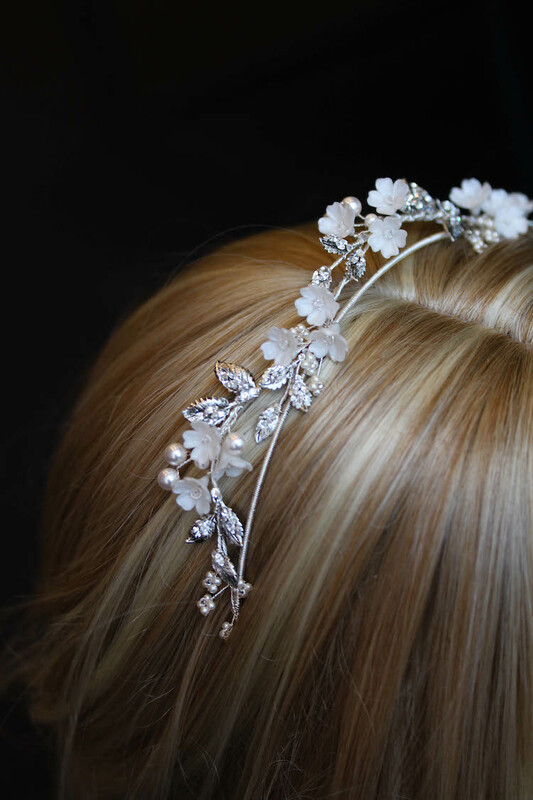 The Gabriel crown is a statement piece that beautifully captures the essence of an enchanted and overgrown garden bursting with botanical details. Decidedly feminine and with modern chic appeal, the Gabriel crown is an heirloom piece that you’ll love to pass on. Gabriel is exquisite on its own or style it with a veil for a look that’s romantic and ethereal. Gabriel can be styled with a full gathered veil or a simpler drop veil in fingertip, chapel or cathedral length. We love to design our wedding halos for wedding gowns with open necklines – off the shoulder, low fronts, low backs, cap sleeves. It can also suit long lace sleeves and high necks, depending on the gown. We love to style Gabriel with all romantic hairstyles. It sits securely in loose curls, can work into low set buns, and is the perfect finishing touch to half-up hairstyles. The Windsor silver wedding crown stuns with its overgrown vines, delicate details in antique silver tones. Impeccably detailed with countless crystals, this statement piece brings together new world opulence with old world regality. The Windsor wedding crown perfectly complements ladylike yet modern cap sleeves, illusion necklines, feminine sheer dresses, boho chic gowns, and floaty silhouettes. Style the crown further back for a touch of regality. Or wear it across the forehead for a look that’s bohemian luxe. We also love to style it with or without a veil. For an elusive look, we adore Windsor with a long chapel length veil finished in Swarovski crystals or a dramatic raw edge veil with blusher that floats beautifully behind you. Fayette, French for ‘fairy’, is a minimalist halo filled with the spirit of a secret garden. But don’t let it’s whimsical name distract you. Fayette’s delicacy was inspired by the natural and mythological world in every sense. It winds and curves around the contours of a romantic hairstyle, and its exquisite botanic details add bohemian appeal and quiet wonderment. We love to style the Fayette halo with both relaxed and formal wedding gowns, sheer-panelled dresses, illusion necklines, cap sleeves, high necks, low backs, sleeved gowns and textured gowns. Style it with loose and romantic updos, half up hairstyles and loose relaxed waves. We love how the Fayette looks in voluminous hairstyles with middle or slightly side parts. The soft curves flow beautifully around the head in a way that’s effortless and elegant. Pair the Fayette with a raw edge drop veil, such as our Blair or Rosella veil. For a look that’s breathtaking, we love to pair Fayette with our Lisette pearl embellished wedding veil.